Quatrix approached Style House Creative to re-brand it’s 30 year strong business in 2018. Style House Creative is developing a new collateral range of assets including a full stationery kit, new vehicle fleet of trucks, a diecut gatefolded promotional brochure and a mobile-responsive eCommerce website. Quatrix offers three decades of expertise in intercoms, cctv, access control, digital tv, project management, a customer helpdesk and maintenance contracts. 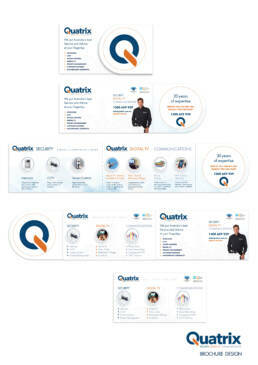 Quatrix specialise in security, digital tv and communications. Style House Creative are proud to be working with Quatrix to assist their new brand to new heights within the technology, security and communications sectors.